Bull Horn could prevent this from happening to you! Why invest in an ATM Alarm or ATM Chain from Bull Horn? Ram-raids, smash and grabs, are on the rise at an incredible rate. ATM industry experts state that this is not only happening in the U.S. but all over the world, and only going to get worse. Why make your ATM a target for thieves who may crash through store fronts, damage buildings, merchandise, equipment, and then leave with the ATM and all the money in it? This costs merchants tens of thousands of dollars in unnecessary losses. You can prevent this happening to you with a Bull Horn ATM Alarm. Bull Horn ATM Alarm is the #1 name for physical ATM security. Over 5000 units sold since 2005. 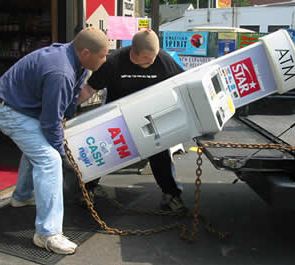 35 confirmed cases of ATMs attacked containing over $420,000.00 in cash saved by Bull Horn ATM Alarm. 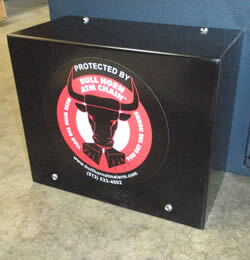 The ATMIA Insurance Program endorses the Bull Horn ATM Alarm. A discount up to 20% may be applied to the coverage of any ATM containing the Bull Horn ATM Alarm. For more information, email gnpalmer@asrisk.com, or call (704) 358-4838. "The Bull Horn ATM Alarm has proven itself to be a robust and powerful deterrent to would-be ATM thieves." "After thieves seriously vandalized two ATM's, totally destroyed another one and stole a brand new ATM along with the cash inside, we decided to find a source of additional security. After much study, we made the commitment to purchase and install Bull Horn ATM Alarms on all of the ATMs that we own and load. Since doing this, about two years ago, we have had no vandalism or theft. 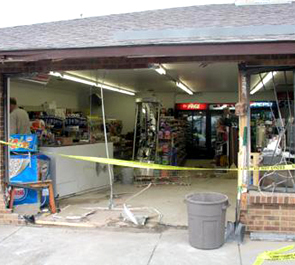 Recently, not far from where we had a previous ATM stolen, another location of ours was broken into. Items were broken and stolen from the store. The only thing not tampered with was the ATM. I attribute this to the ATM being protected by the Bull Horn ATM Alarm. The decision to install the alarms on all of our ATMs has brought our company more piece of mind than any other single decision we have made since starting the business." "Best product to come to the ATM industry in some time. I recommend Bull Horn ATM Alarm for the protection of your ATM portfolio." "We sell offsite ATMs to banks & credit unions, they like the idea of having an alarm in the ATM out in remote areas and not having to pay monthly monitoring fees. The Bull Horn is the low cost answer." 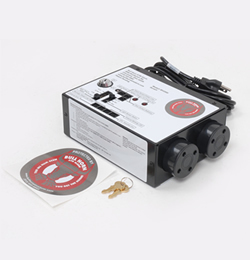 "Easy to install, simple operation, good price and most of all peace of mind. Thanks Bull Horn ATM Alarm"
"UTSC was having an issue in Springfield MA where 5 ATMs over a 1 month period were broken into with sledge hammers. The store alarms were disabled before entry. We have since alarmed all of our machines with Bull Horn ATM Alarms and it has been a year without a break in. I highly recommend Bull Horn ATM Alarm." "The Bull Horn ATM Alarm is great since they are a flexible, small unit that can be configured for different types of installations. We have not had one problem at any of our ATM installations that use the Bull Horn ATM Alarm. Thanks for the great service too!" "We have had 4 attempted burglaries of our ATMs since we started installing them in Feb 2009 and Bull Horn stopped them all. I recommend it to anyone in the ATM industry because it works!" Triton Tranax Tidel Cross WRG NCR Diebold Nautilus Hyosung etc. It can also be used in Coin machines Vending machines Kiosks Slot machines etc.